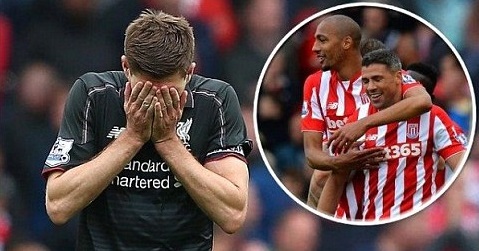 In the last matchday of Premier League 2014-15 season Stoke City hosted Liverpool where Liverpool need a win to make sure they qualify for the Europa League next season as Tottenham had a chance to overcome Liverpool in the table if Liverpool were to lose the game against Stoke City. The game started with a similar feel where Liverpool found it hard to break down stoke City who were all over them on the counter attacks and it took just 22 minutes for Mame Diouf to score the opening goal of the game which was later doubled within a few minutes when Diouf scored his second and Stoke City looked like cruising at 2-0. It was Steven Gerrard’s last game for Liverpool as he already accepted a move to LA Galaxy in the summer but his last outing proved quite embarrasing for Liverpool as they concered 5 goals inside first half. Walters scored the third while former Liverpool player Charlie Adams made it 4-0 beofre Nzonzi scored the 5th in 45th minute of the match leaving Liverpool players and fans shocked.